Last of the asparagus – one bunch, three dishes….. This short but sweet season for those wonderful green spears has come to an end. The 23rd June sees the asparagus fields left to put in the growth that’s needed for next year’s harvest so despite the late start, farmers won’t be cutting anymore. I celebrated this weekend with the last large bunches from Michael Bourne at Groombridge Farm Shop and made a few of my favourite dishes. You can still find the last pickings in some shops and supermarkets this week but make the most of it. 1 Cook the vegetables in a little simmering water for 2 – 3 minutes until almost tender then drain, reserving the liquid. Put 1/4 into a blender goblet with half the butter, the herbs and 3 tbsp of the cooking liquid. Make the rest of the liquid up to 1.5 litres with the stock. Heat the oil in a heavy-based saucepan. Add the shallots and garlic and cook for about 3 minutes until softened. Add the rice and stir to coat in the oil. 3 When the rice is tender, add the reserved vegetables and cook for another minute or two to heat through. Stir in the herb butter and the cheese and heat through; adjust the seasoning. Serve immediately in warm bowls. 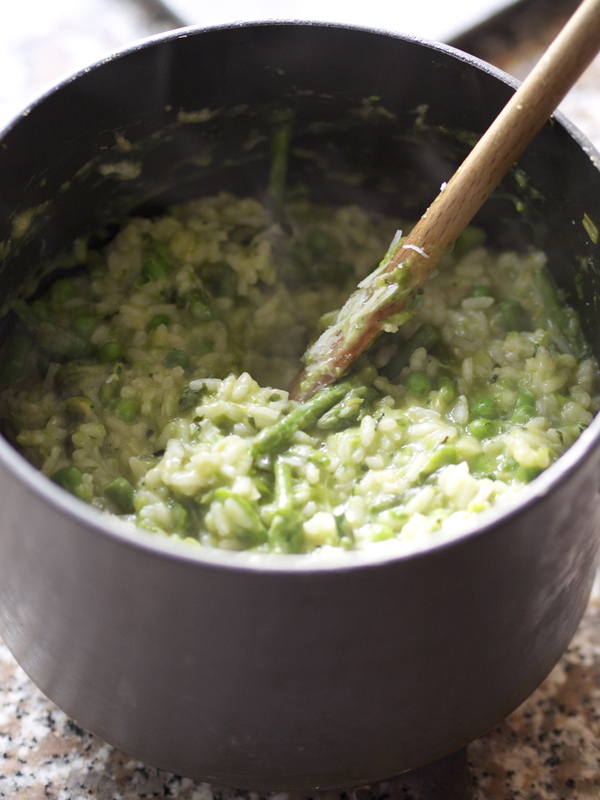 My tip for easy risotto: To get ahead use the chef’s tip for risotto and cook up to the stage of adding the rice and first amount of liquid. Then just remove from the heat and set aside. Then when you are ready to serve the risotto, reheat the base, return the stock to simmering point and complete as the recipe directs you. 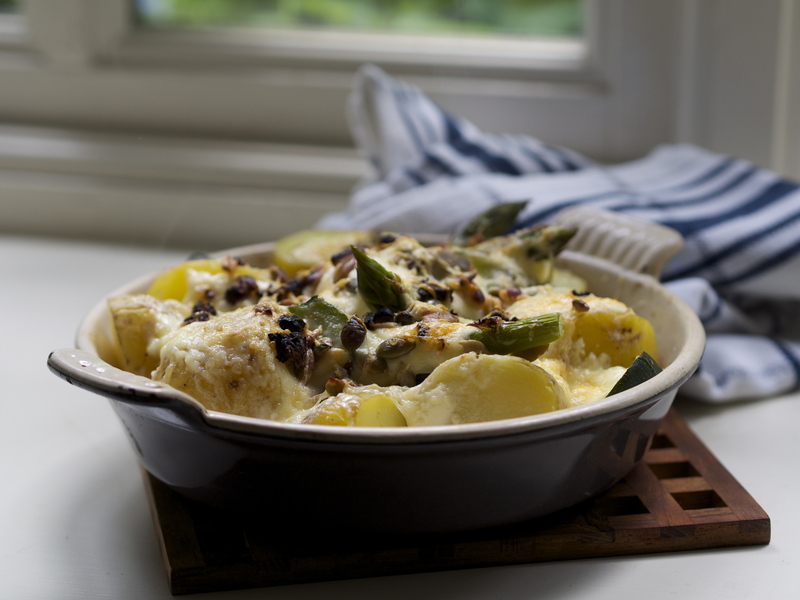 Saturday night’s supper kicked off with the classic – steamed spears with home made Hollandaise (see previ ous asparagus post for my recipe) then Sunday lunch was a meal in a hurry so I just looked in the fridge and found new potatoes, courgettes and the rest of the asparagus. I’d kept the remaining Hollandaise from Friday (or you could use a ready made version) so just steamed the veg and then arranged it in a gratin dish. A spoonful or two of hollandaise over the top, a scattering of mixed seeds and pine nuts and a little grated Parmesan then under the grill until bubbling. 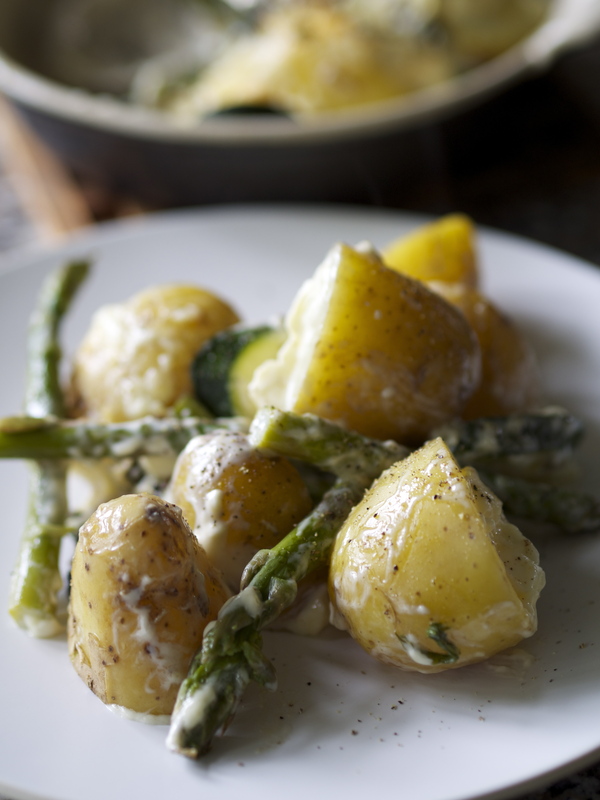 Perfect with some good sour dough bread, and you can substitute any green veg such as broccoli, leeks or green beans for the now out of season asparagus….. 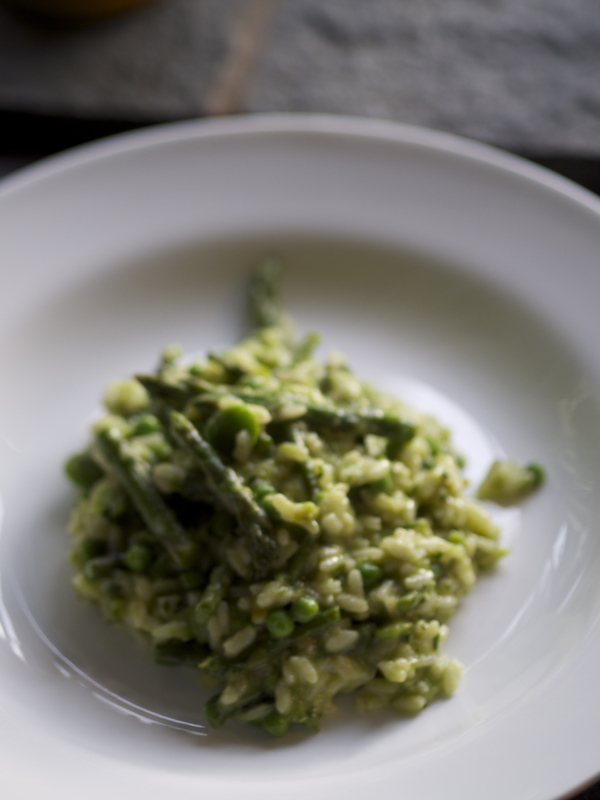 This entry was posted in In season, Recipes and tagged Asparagus, in season, recipes, risotto, summer eating. Bookmark the permalink. 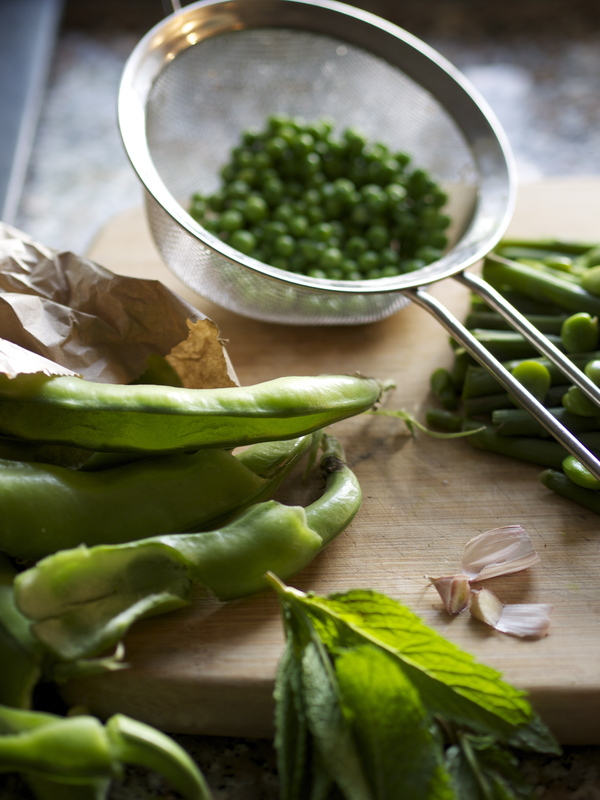 1 Response to Last of the asparagus – one bunch, three dishes…..